Spring is officially here, bringing more people outdoors and more visitors to your home. Uneven, sinking, and broken concrete walkways are not only an eye-sore to your home, but they are also a safety hazard. For those who are looking to put their home on the market in the spring, or for those who simply need to repair their walkways, concrete walkway leveling is a smart and responsible way to extend the life of your concrete and improve your home’s value. Over time, water seepage, the freeze-thaw cycle, poor compaction, and/or faulty drainage can result in what is known as a “void” in concrete. This void can cause cracking in the concrete and disruptions beneath the concrete that cause certain sections to rise and other sections to fall. An uneven concrete surface can easily cause trips and falls to occur by the toe of a shoe catching on lifted concrete. Twisted, sprained, and even broken ankles can happen from stepping wrongly into a dropped section of concrete. 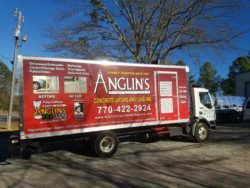 Anglin’s Foundation & Masonry Repairs seeks to identify and address the underlying problems that are causing your concrete walkway to be unlevel. Once the cause is determined, concrete leveling can be successful in correcting the issues and repairing your concrete walkway so that it will last for many years to come. Concrete leveling consists of drilling a series of 1-inch holes into the existing concrete. A high-density filler is pressure-injected into the holes to fill the void beneath the concrete. Once the void is filled, the concrete is stabilized and slowly raised to the desired height. The holes are then capped, and the concrete will be ready for use almost immediately. Concrete walkway leveling is a quick and cost-effective solution to unlevel concrete surfaces. Your home’s entry reveals a great deal about your home: whether it is safe, welcoming, and pleasant. At Anglin’s Foundation & Masonry Repairs, we are here to help you care for your major investment: your home. We have been Atlanta’s trusted source for foundation, masonry, and concrete repair for 87 years. Contact us today for a free estimate.